Posted on August 11, 2006 by Alicia Bay Laurel	in Blog. Dennis Kucinich campaigns on behalf of Senator Dan Akaka, seated on the right. Former Maui Democratic Party Chairman Jonathan Starr, one of the organizers of the event, is seated on the left. August 9, 2006. I land in Kahului, Maui, at 9:30 AM, and, by 1 PM, I am attending a Democratic Party luncheon at the Maui Tropical Plantation at which Representative Dennis Kucinich from Cleveland, Ohio, is campaigning for the re-election of Senator Daniel Akaka. It is the day after Lieberman lost the Connecticut Democratic primary to Lamont, and populists, progressives and peace activists everywhere are beginning to take heart. Maybe the Democratic Party, which once represented the interests of the people instead of those of corporate greedheads, might be forced to do something for us in order to earn our votes. 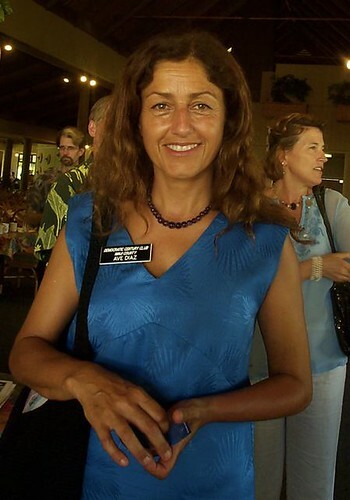 Ave Diaz, who managed the Kucinich campaign on Maui in 2004, and is currently organizing “Careers in Peace,” a program that counsels high school students on non-military options after they graduate. Dennis lauded her efforts from the stage. 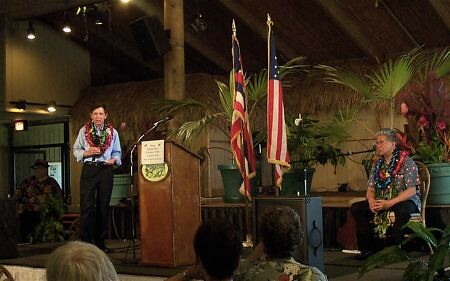 Dennis Kucinich, who has stood up for peace and for the needs of the people thoughout his career, enjoyed enormous support in Hawaii during his bid for the Democratic candidacy for President in 2004, garnering 33% of the statewide caucus vote, making Hawaii one of three states to send Kucinich delegates to the Democratic National Convention that year. His endorsement counts big with Democrats in Hawaii. 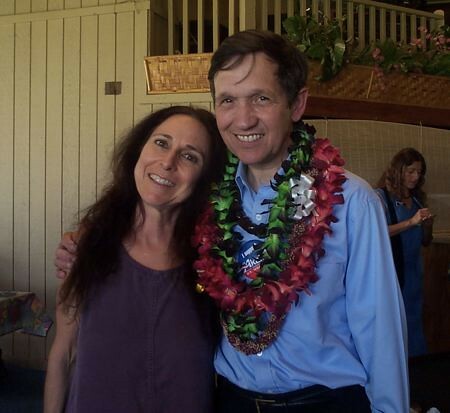 Kucinich enumerated his reasons for supporting Senator Akaka. Akaka was one of 23 Senators to vote against the invasion of Iraq. Akaka sponsored the Nuclear Non-proliferation Bill. He opposed the PATRIOT Act. Akaka has voted for civil rights, worker’s rights, and, mostly, for environmental protection measures, other than protecting the Arctic Wilderness from being exploited for oil. Akaka explained that the oil companies bring infrastructure advantages to the residents, like good roads, warm school buildings, and jobs. This is the story of Hawaii, too. Tourism, real estate development, and military base expansion degrade the environment and the lives of the people who live here, but they create jobs, and they get roads built. I see Dennis Kucinich’s point. In his oft-ignored but urgently needed campaign for peace, social justice and sustainability, he wants all of the progressive, or moderately progressive, allies in both houses of Congress he can get. If (“I mean WHEN,” said Dennis) the Democrats regain the majority of the Senate seats, senior senators like Akaka will chair the committees that decide which bills to bring up for a vote, and that conduct investigations. Akaka’s opponent for the Democratic Party nomination for Senator is Representative Ed Case, who supports the Bush administration’s war policy, much as Senator Lieberman has. But this year, with polls showing the majority of Americans sick and tired of the Bush cabal’s needless wars, police state, and inept governing, politicians who follow the money instead of listening to the people may find themselves out of Washington. Aligning himself with an unflinching progressive like Dennis Kucinich will do nothing but good for Senator Akaka.